I’m one of three children in my family. I’m the oldest, my brother Brian is 3 years younger than me, and my sister Robin is one year younger than Brian. We’re close and have a warm relationship with one another but, with me in Minnesota and Brian in New York and Robin in Florida – we’re rarely all three in the same place at the same time. 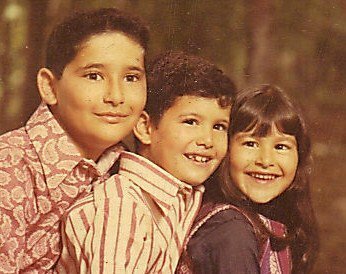 I know that’s true of lots of siblings – and there’s a part of me that’s jealous of those of you who do live close to your brothers and sisters. And for the young kids in our congregation, I wonder how much they appreciate what a gift it is to have their siblings living in the same house with them. We have a joke in my extended family that, whenever my brother and sister and I get together and someone wants to take a photo, the three of us “assume the position.” The position is the pose that the three of us have had for group pictures from the time we were little kids: We revert to age order: I’m on the left, Brian is in the middle and Robin is on the right, and we all three stand or all three sit with our bodies facing left and our heads tilted to the right facing the camera. I was looking at a whole bunch of photos of us situated in this pose on Facebook the other day and was reminded of how much I love my brother and my sister and how grateful I am that we are close. However, from the details of the Torah itself and from rabbinic tradition, we understand the actual birth order to be Miriam, Aaron and Moses. "If two people had quarreled, Aaron went and sat with one of them. He said, 'My son, see what your neighbor is doing: He is tearing out his heart and rending his garments, and saying, "Woe is me, how shall I lift up my eyes and look at my neighbor? I am ashamed in front of him, because it is I who acted offensively towards him."' [Aaron] sat with him until he had removed hatred from his heart. Then he went and sat with the other, and said the same things to him. So that when these two met, they embraced and kissed one another. (Avot DeRabbi Natan, Version A, Chapter 12). But, more importantly, he is the one portrayed in our tradition as the ultimate eved adonai (“servant of the Eternal”) [Deut. 34:5] in the struggle for liberation from oppression; and the ultimate prophet in seeing God, so to speak, “panim el panim” (“face to face”) [Deut. 34:10]. In later Jewish tradition we know him as Moshe Rabeinu (“Moses our Teacher”) who receives the Torah and shares it with Israel – who in turn share it with the world. Rabbi Holtzman, at the time of my installation in Plattsburgh, was gracious enough to say to my congregants there that I, as their new rabbi, had something of each of those qualities – Miriam’s ability to inspire joyful worship, Aaron’s ability to promote peace and friendship, and Moses’s ability to teach and lead. Of course, I do not claim such qualities – rather I merely aspire to them. So I share this recollection not to highlight my own talents or my own shortcomings -- But rather to encourage us all to aspire towards these qualities in ourselves individually, and in ourselves as a community. How can each of us strive to be more like Moses? How can we try harder in our lives to discern the right path – the path of justice in our world and integrity in our lives; the path of spiritual communion with God in whatever way we understand God? How can each of us strive to be more like Aaron? How can we try harder in our lives to let go of grudges, to give people the benefit of the doubt, to bring about peace and reconciliation where there is strife? And how can each of us strive to be more like Miriam? How can we try harder to cultivate joy, optimism and faith in ourselves; to let our voices sing; to let our bodies dance; and to share this outlook with those we encounter each day? Immediately before the start of Shirat Hayam, the Song of the Sea, the Torah says, at Exodus 15:1 -- אָז יָשִׁיר-מֹשֶׁה וּבְנֵי יִשְׂרָאֵל אֶת-הַשִּׁירָה הַזֹּאת, לַיהוָה. / “Az yashir Moshe uveney yisra’el et hashirah hazot ladonai. […]” The Plaut Torah Commentary translates this as: “Then Moses and the Israelites sang this song to the Eternal.” However the verb “yashir” is in the future tense so that it would seem that the verse should be translated as “will sing” not “sang”. Various medieval commentators offer various grammatical and philosophical explanations for how to deal with this linguistic anomaly. But I think for us it works best to take it on both levels – As we gather together on Shabbat we give thanks in song and prayer for all the blessings we have experienced in the past and that we experience in the present. And we affirm our faith that we will have reason and capacity to sing of deliverance in the future as well. Posted on January 14, 2014 by Ethan Kayes and tagged Beshallach.